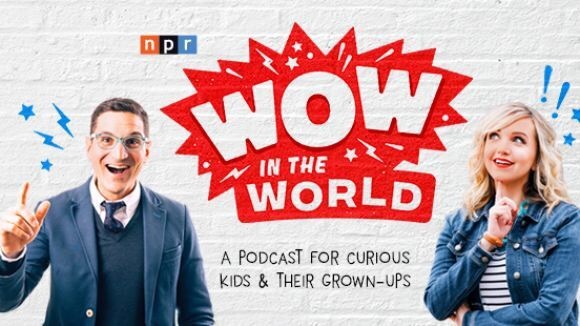 Wow in the World is a new podcast by Guy Raz and Mindy Thomas. I know them from Kids Place Live and met both last summer! They are super funny in real life. I had to help Guy with his Penguin facts though. The podcast has them sharing interesting facts in a way that kids will like. For instance, they had a picnic in a landfill. I bet they really weren’t but you have fun pretending they are. Kids are really curious and this show helps them. I like to listen in the morning while eating breakfast. I wish there were more episodes already! I guess this also teaches patience. I recommend this podcast to kids and parents a like! I give it an infinite number of stars! Chloe’s Friendship Circle has a funny interview with Mindy and they talk about the show. Today’s Friday Funny is my own Super Happy Party Bear Dance Playlist. I love dance parties and so do the Party Bears. So let’s have a Friday Dance Party. Just know before my parents found Kids Place Live, we listened to their playlists. Now we mostly listen to kid’s music but some songs are still favorites. We start our playlist with Get this Party Started (Shirley Bassey version). When I was in Washington, DC, I met Tori, the producer for Kids Place Live. She is really funny and cool, so I asked her questions. I learned we love the same music..
Tell me about yourself: I work for SiriusXM in Washington, DC, specifically for Kids Place Live and Radio Classics (a channel exclusively for old-time radio shows). In my free time I love to read (lots of mystery novels) and cuddle with my dog, a little red miniature pinscher named Nala! How long have you been in radio? 2 years professionally plus 3 years of hosting a college radio show. How did you get into it? College radio! I joined WRGW at George Washington University and fell head over heels in love with it. I had a music show for three years where I played a wide variety of music. I also oversaw all our music shows as the station’s Music Director. I found SiriusXM at an internship fair and interned here with the Folk music channel (The Village!!) for a summer when I was in college, then when I graduated Mindy and Kenny hired me full-time on Kids Place! It’s been a dream come true ever since. What is the best part of being on a kids show? We never stop laughing. Every day at work feels like hanging out with our friends and having fun. The kid listeners inspire us to be more creative and positive, which in turn helps us create content that kids and their families will truly enjoy. Also, we get to listen to, and earnestly debate, songs about farts. I like this book. It is about Pirates on a farm. They are silly farmers. They think they are sea but they are on shore. They make funny neighbors. The boy and his family help the pirates but mom is afraid of the pirates at first. It all works and the pictures are funny. My mom made me read this book. She says I am whiny some days. I hated this book because I think I am not whiny. It’s true. Don’t believe Mom. Ok, I didn’t really hate the book. I just don’t like Mom saying I am whiny. This book is about whiny children who get captured by monsters. The monsters want to eat the whiny children but they keep fighting over how they will eat the children. One wants to eat a whiny children sandwich. Another wants whiny children soup. And one wants whiny child burgers. More monsters have an opinion on this and they just can’t make a decision. By the time they do, the children have run away [OOPS, SPOILER]. The children swear they will not be whiny again, but the books says they are. I recommend this to whiny children (Mom says this is all children). I bet parents would like this, especially whiny parents. Actually parents will like it more than the kids. It is a funny book.